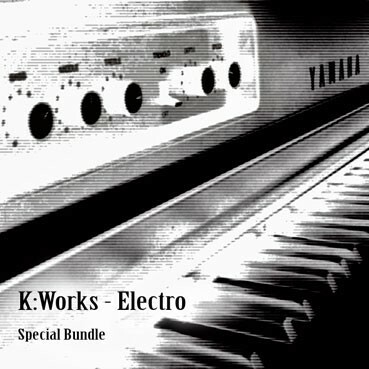 The K:Works - Electro - Special Bundle includes our K:Works - Electro Volume 1 - Volume 3 sound program collections for an exclusive discounted price (Worth 99,85 € / Save 20,85 €). A complete collection of piano and organ sound programs in traditional or less conventional retro feeling, including a complete KB 3 Mode of drawbar organ emulations. It’s a great complement to the Workshop, Analog & Digital, Modern Synth and Orchestral collections. In addition to this, all Kurzweil K2xxx ROM and FARM "Electro" sound programs, newly sorted and well organized by Art of Sound to achieve easier access and use, have been added free of charge as a bonus.